Released as a villain in the 1990 assortment of TMNT toys from Playmates, Pizzaface was out-there even by that line’s standards. 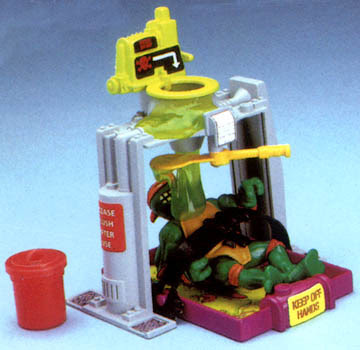 And endeavor to keep in mind that this was the line that gave us a torture-toilet playset. But what makes Pizzaface so unrelentingly awesome is just how positively berserk with imagination he is. Not just his character design or base concept, either, but even his origin and motivation is completely bonkers in all the right ways. I mean, most TMNT action figures had their histories and personalities described in one, maybe two sentences on the back of the card. Pizzaface? Two freakin’ paragraphs. 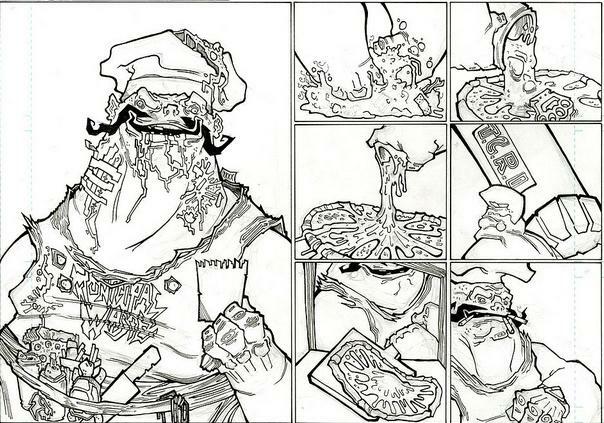 “Pizzaface - Shredder's crazed culinary creator - had a plan to become the most powerful pizza chef ever. So he zapped himself in his Retromutagen oven, hoping the energy would bake him with badness. But the hungry Turtle Teens burst into the parlor and pulled Pizzaface out. Now this half-baked bozo wants to get even with the Turtles for foiling his formula. All the Turtles wanted was a large pepperoni to go - but instead they got part pizza and part Pizzaface! Let me summarize for you. Pizzaface was a chef working for the Foot who thought that he could become “the most powerful pizza chef ever” by baking himself alive inside a radioactive oven. The Turtles valiantly foiled his brilliant scheme, but in the end his DNA was forever mutated, making him part man, part pizza. Now, he travels from pizza parlor to pizza parlor, poisoning pizza pies with any number of explicit ingredients like some urban legend from your worst nightmares. And he delivers, too. So don’t answer the doorbell. But the highly sophisticated qualities that make Pizzaface totally friggin’ boss don’t just end there, no sir. The story behind Pizzaface is even more bizarre, gruesome and surprisingly ghoulish. 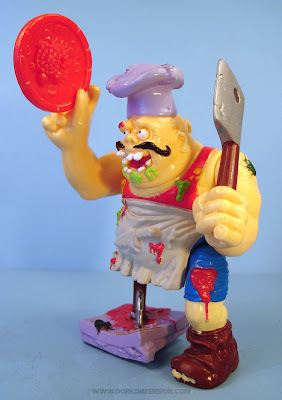 The original prototype for the Pizzaface toy painted a far more macabre portrait of the diabolical culinary. As any owner of the original Pizzaface toy most certainly noticed, he is inexplicably missing his left pinky finger. Of course, he’s also missing his entire right leg, but there’s actually a shockingly horrific reason why his pinky isn’t there. He chopped it off, baked it into a pizza and tried to force-feed it to the Turtles. According to the toy's sculptor, David Arshawsky, the missing finger was originally molded into one of Pizzaface’s throwing-pizza accessories as one of the many revolting toppings (alongside dead rats, squirming roaches, shuriken, nails, squashed baby turtles and hand grenades). Playmates ultimately decided that the idea of him severing body parts and stuffing them down the gullets of our Heroes on the Halfshell was too violent, and so they took the finger out of the pizza accessory… without reattaching it to his hand. Yes. Pizzaface was originally going to have a meatball-shaped, moustacheoed Siamese twin growing out of the top of his skull, hidden beneath his chef’s hat. 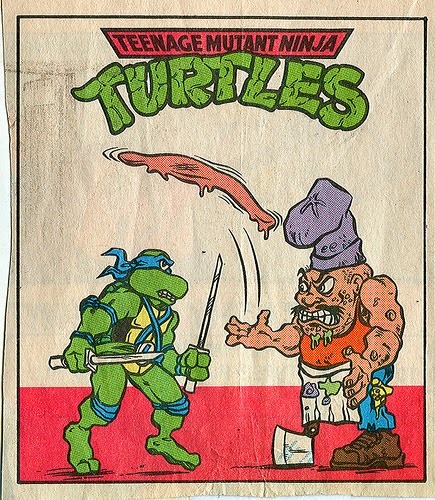 Sadly, Pizzaface ranks primarily as the biggest waste of potential in TMNT history. He never appeared in the Fred Wolf cartoon or Archie comic book series (the two pieces of media responsible for promoting the action figures) and summarily drifted off into the realm of TMNT character obscurity alongside Halfcourt, Monty Moose and Sgt. Bananas. Well... It's something. Not much, but something. Thankfully, fans exist. And the remarkably talented folks at Workhorse Illustrations gave us a pretty bitchin’ three-page comic, “Raph n’ Casey VS. Pizzaface”. It boasts all of Pizzaface's gimmicks seen through a truly wild artistic lens. A tip of my hat to you gentlemen. Pizzaface is a psychotic, peg-legged, meat cleaver-wielding Italian chef with a Siamese twin growing out of his skull who chops off his own body parts, bakes them into pizzas and feeds them to the Turtles in an attempt to poison them because they foiled his plan to bake himself alive inside a radioactive oven. I believe that you are only allotted ten opportunities in your entire life to sincerely use the term “rad” to describe something. Now, I only have six rads left. It was totally worth it. So I've been asked to update this dissertation on Pizzaface by a number of fans. And why is that? Because he recently appeared in the Nickelodeon TMNT animated series as a guest villain. My life is complete. 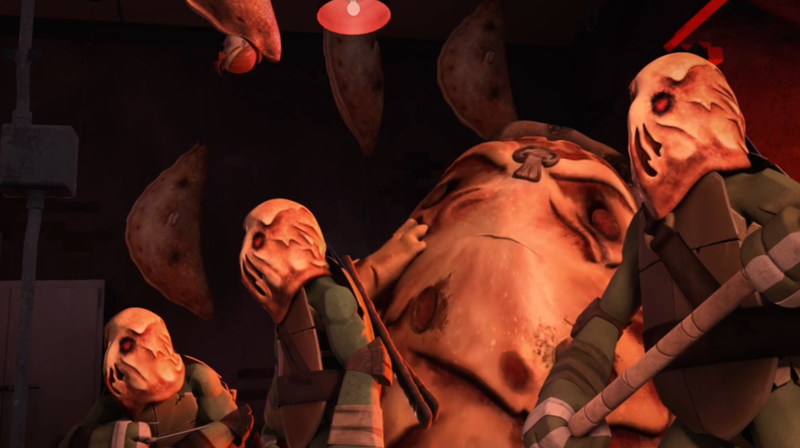 As seen in the episode aptly titled "Pizza Face" (with an inexplicable parse in his name), a pizza chef named Antonio discovers a canister of Kraang mutagen in an alley outside his restaurant. Always up for discovering new toppings, he decides to taste the glowing ooze. Now he's a giant pizza-man. One of the Nickelodeon cartoon's greatest skills is its ability to mimic different genres depending on how the writers, storyboarders and directors are feeling on a given day. When they do a horror episode, they do a HORROR episode ("Of Rats and Men", "Within the Woods"). And when they decide to do a full on zany comedy relief episode, they pull out all the stops. "Pizza Face" is one of those episodes; so weird and bizarre even by this show's standard that it has to include an ambiguous ending potentially relegating the events to "just a dream" territory. Because this story involves a pizza-man delivering poisonous talking pizzas to unsuspecting New Yorkers in a scheme to hypnotize them so that they'll march to his pizzeria and bake themselves alive in giant calzones (so he can eat them). It's absolutely bonkers and just about everything I'd ever hoped for in a Pizzaface story. There's even a musical number sung by John DiMaggio (doing a Super Mario impression for his Pizzaface voice) with lyrics set to the Italian... pizza... song? Does it have a name? You know the one I'm talking about, right? 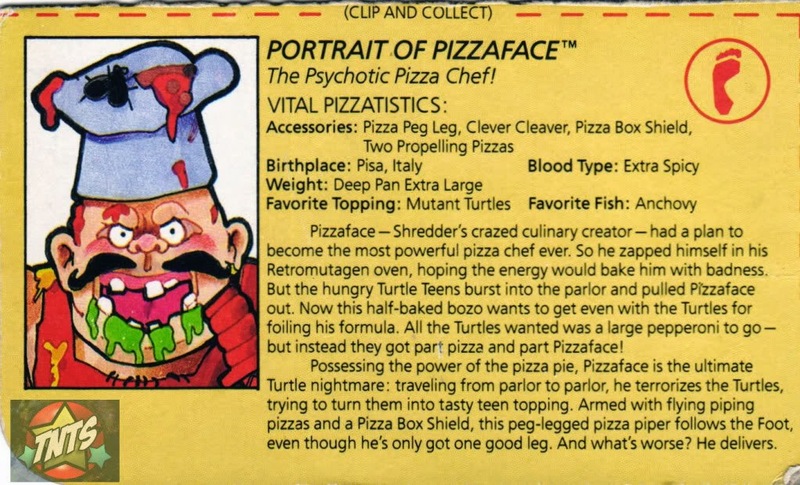 Pizzaface's MO in this episode is similar to what was originally described on his toy card (delivering tainted pizzas in an attempt to kill the Turtles), but writers Kevin Burke and Chris Wyatt add an extra layer of nastiness to it by making Pizzaface a cannibal. 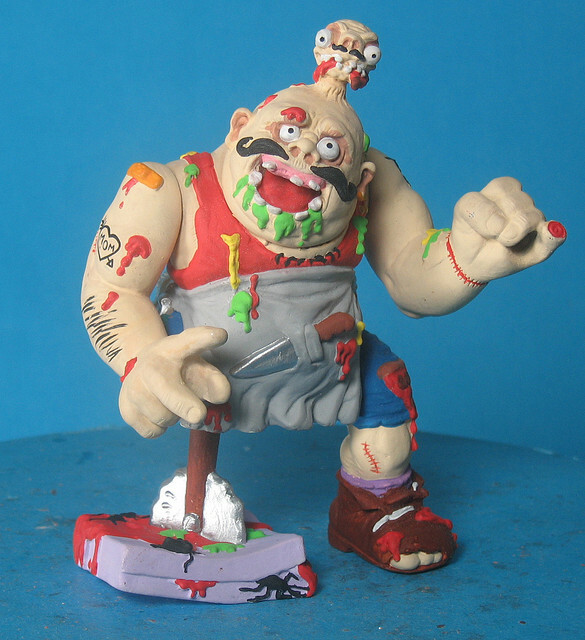 They even retain the concept discussed above from the prototype toy, in which Pizzaface would taint the pies with his own dismembered body parts. Albeit, rather than fingers, Pizzface is now made entirely of pizza, using his cheesy flesh to make the consumables. And that does bring me to my one criticism. Pizzaface as depicted in the Nick cartoon looks nothing like the mad chef from the original toyline. Instead, he's an homage to Pizza the Hutt from "Spaceballs". I suppose transforming him into a giant mozzarella slug made it easier to get cannibalism past the BS&P censors. And yet, the Pizza the Hutt homage is not without precedent! Recently through some eBay listings, I stumbled upon this genuine Pizzaface action figure design sketch from Playmates artist Errol McCarthy. Notice what Pizzaface's original working name was going to be? That's right. "Pizza the Hut". And we've come full circle. So, what does the future hold for Pizzaface? Will he make a second appearance in the Nickelodeon cartoon? Will he show up in the IDW comic? Will Playmates make a new action figure for him? Only time will tell. But one thing is for sure: Pizzaface always delivers.. I don't *think* that was me; I just remember bringing up his prototype toy. The newspaper strip used to be available through Go Comics, but after the Viacom buy-out the strip went down and hasn't resurfaced since. I don't recall Pizzaface being in there, though I remember an arc involving the Rat King. 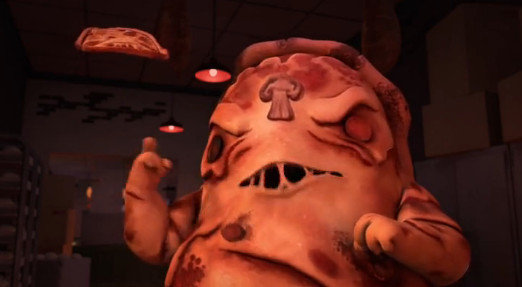 So what'd you think of the 2014 cartoon's version of Pizza Face? For the record, the song is called 'Funiculi Funicula'. Thanks! I guess I could've googled that, but dammit man, there's no time! Whoah, is that Jim Lawson drawing Pizzaface? Whoops, mixed it up with another Italian song in my head. It's actually "La Tarantella Napoletana"